they can apply online for this Armed Guard jobs for their respective city before the closing date of 18-02-2019. Candidates selection will be based on written exam marks and physical tests. 10th passed candidates only eligible to apply. Written Exam Pattern and Syllabus also updated in this notification. Official website to online application form submission for this UBI Armed Guard Posts. Age limits, selection process, exam syllabus, how to apply and other details are mentioned below in detailed. Online form submission Last Date is 18-02-2019. 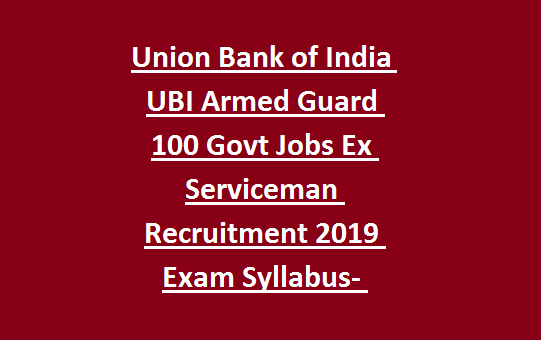 There are total 100 Armed Guard Jobs in this UBI Union Bank of India Recruitment 2019. Upper age limit is 45 years for Ex Serviceman. 10th class passed candidates only eligible. 10+2 qualified or its equivalent qualification having candidates are not eligible. Monthly approximately Rs.18000 and allowances. For all Ex serviceman application fee is Rs.100/-. Pay the application fee online only. Written Exam and physical tests are conducted for this UBI AG Posts. Online test will be conducted for 70 marks. Minimum qualifying marks for reserved candidates is 25 and for other 28. Must have secured 10 marks in Reasoning section. Total 70 questions will be given and each question carries one mark. It shall cover Organizational Structure, Navigation, Section level Weapons, Section level tactics, general topics related to Military, Air Force, Navy & Police, use of weapons in relation to right to private defense and legal consequences, etc. 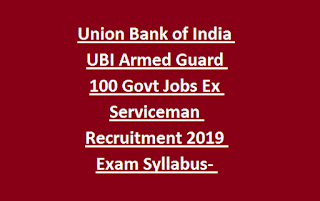 Online application form submission closing date is 18-02-2019 for this Union Bank of India Recruitment of Armed Guard Posts. Official website to apply online is https://www.unionbankofindia.co.in.